Shakshuka eggs are ideal for breakfast, lunch or brunch. The recipe is of Middle East/North African origin and is made by poaching farm-fresh eggs in a spicy tomato/vegetable sauce. It is extremely popular right now, especially as a vegetarian dish. Larry’s All Natural Ranchero Sauce is a perfet poaching sauce. So, all you need is a deep skillet with a lid, eggs, tortillas and some fresh cilantro for a garnish. 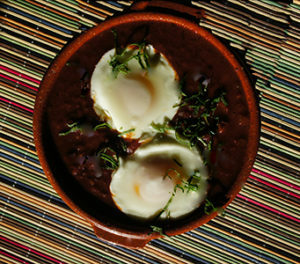 Shakshuka Eggs is sure to become a favorite recipe. Shakshuka Eggs Ranchero is a delicious vegetarian dish of Middle East/North African orgin.